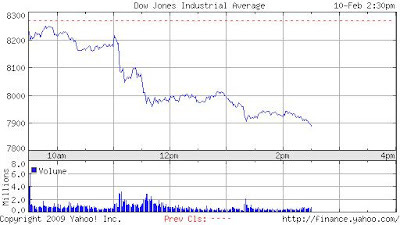 The Dow was off around 4.5% by 2:30pm EST. Leading the losses were financials with Citi (C) off 13% and Bank of America (BAC) off 18%. The London FTSE sold off just before its close (and just before the speech), it ended down 2.2%, Hong Kong closed even. Oil continued its march down as well with crude futures at $38/bbl. This is probably in expectation of continued economic problems and dashed hopes of recovery. Clusterstock – Will Geithner’s Weak Speech Spur Another Panic? Our reaction to the speech was to ask a lot of questions. Here is what we wrote, awaiting a longer post on the private equity component (or at least our thoughts since the “plan” didn’t have much in it). Russia may experiment with a bad bank program, or at least letting its banks manage impaired assets with government assistance. The Russian government is also attempting to stimulate its economy and domestic production by subsidizing auto loans. Russia’s stock market was up 6% earlier today, the rouble does appear to have stabilized against the dollar, though it is still at a historic low of around 36. Nouriel Roubini writes “The Anglo-Saxon Model has Failed” in concluding that our model of financial regulation is no longer viable. Roubini’s piece is a list of answers from readers [free registration required].